Region: This Caterpillar is found throughout the United States. Life cycle: This insect produces three generations each year and overwinters as a pupae in cocoons in bark or on ground debris. Physical Description: This 1-inch long caterpillar is yellow with black bands behind its head and longhairs on each segment. Eastern species will have an orange collar. The adult moth is dark gray or metallic blue with narrow wings that span 1 inch. The eggs are laid in groups on the leaves of the host plant. 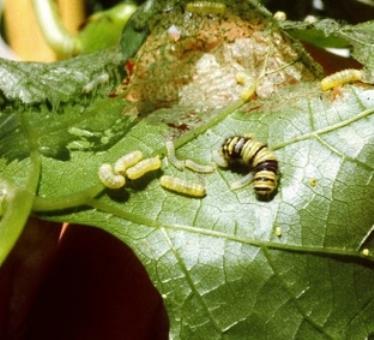 Feeding characteristics: This pest attacks the grape plant by feeding between the veins on the underside of the leaves. They will form and feed in small colonies or groups. They seldom cause very much damage. Controls: Controls are very seldom necessary and handpicking will usually be sufficient.